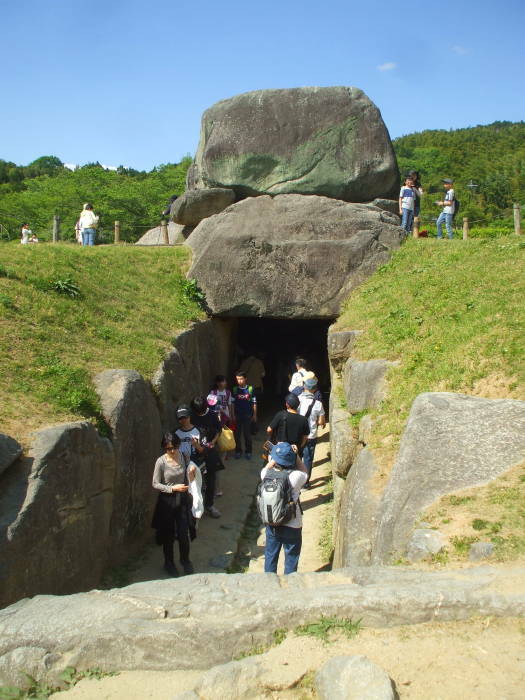 Ishibutai kofun is the only megalithic tomb where the earthen mound is gone and you can see and even enter the structure. 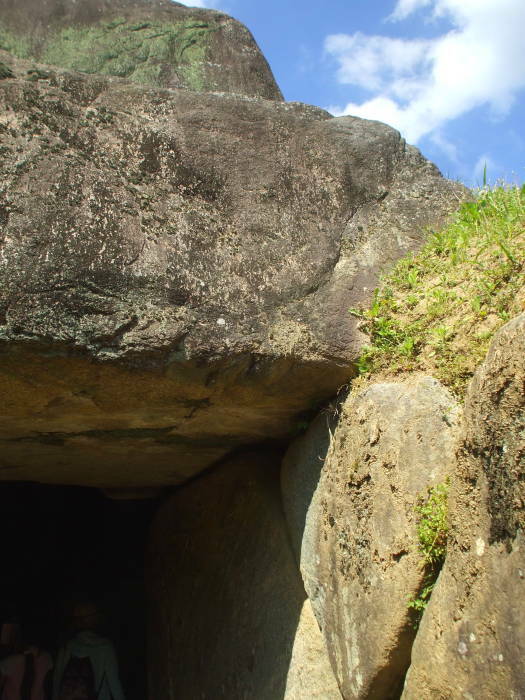 The same quasi-historical documents that defined the belief in the legendary Emperors descended from the gods spoke about something, interpreted as this structure, as the tomb of someone who wasn't the Emperor or a member of his family. 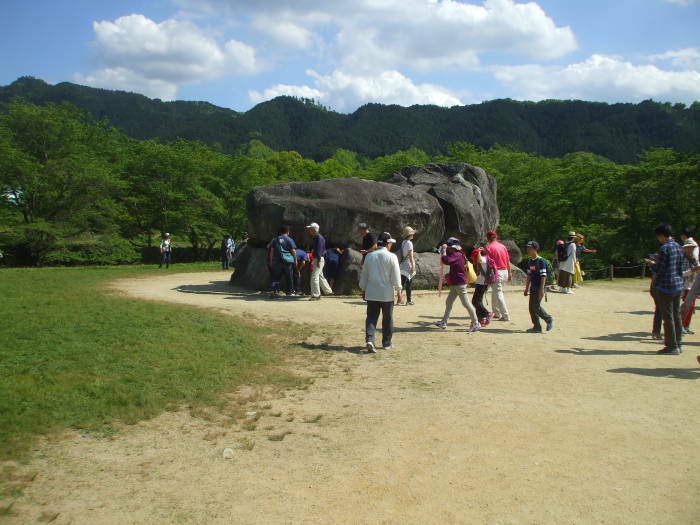 Ishibutai kofun is a short distance east of the Asuka rail station. Buses run every hour between the site and the square in front of the station. Soga no Umako was a member of the powerful Soga clan of Japan. He was born around 551, and died in June of 626. 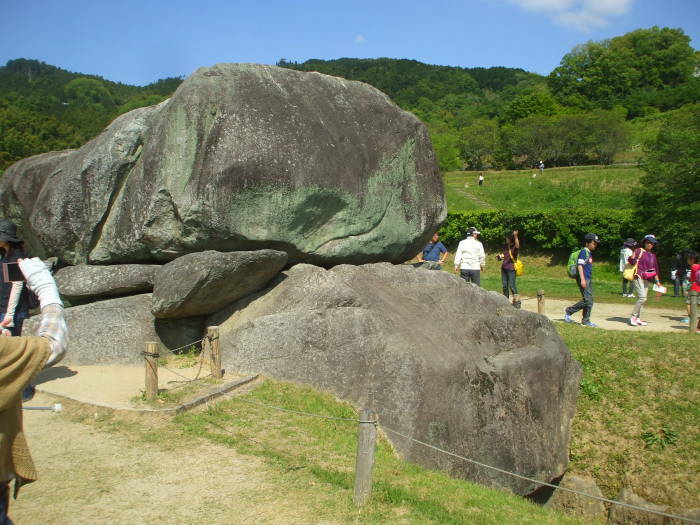 A Japanese archaeologist and historian of the early 1900s proposed that the Ishibutai kofun is that "Momohama", and that the Emperor had the earthen mound or tumulus removed some time after Umako's death and burial as punishment of the Soga clan. 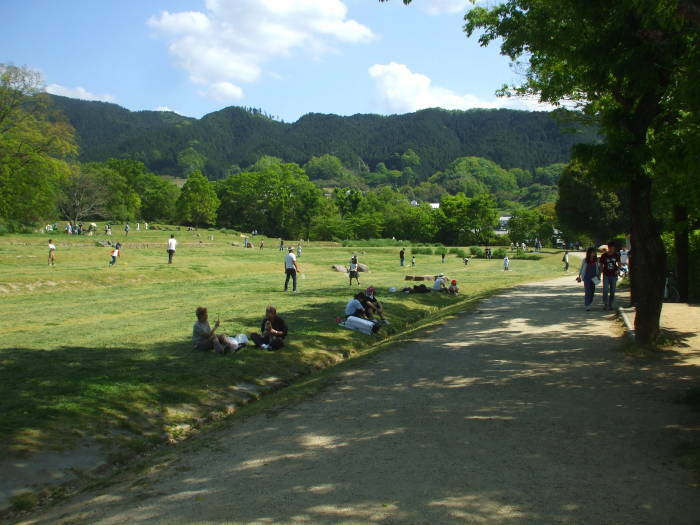 A large park area is now next to the kofun. 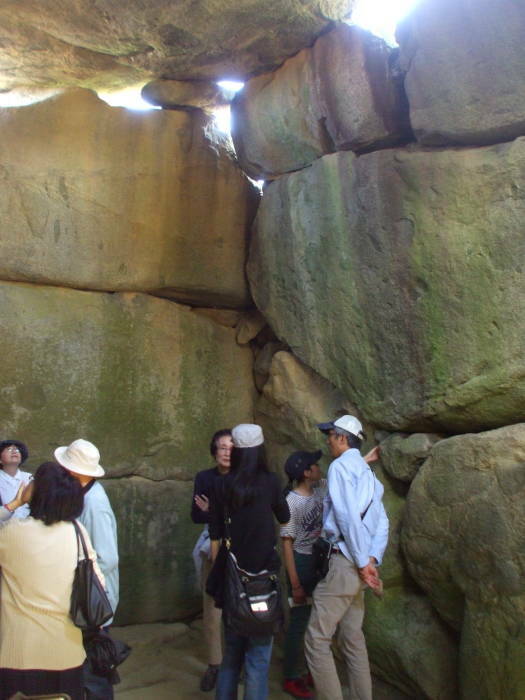 The exposed megalithic structure was commonly known as Ishi-butai, from ishi meaning "stone" and butai meaning "stage", at least since the 1600s. 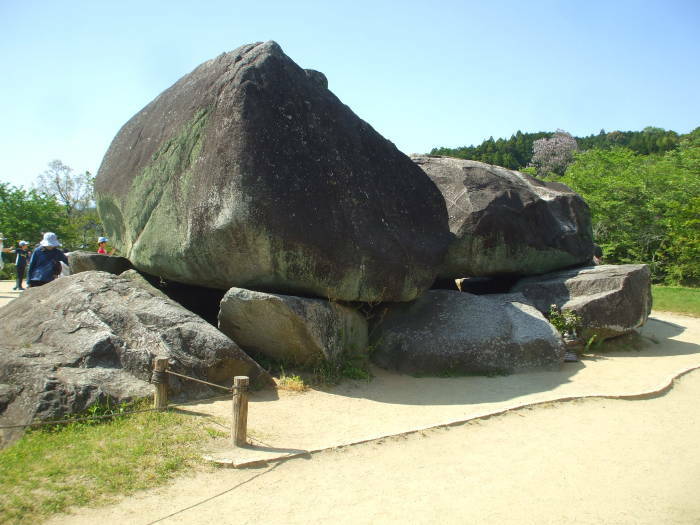 That was during the general period of the Shōgunate, the time from 1185 to 1868 when the top warlord, the Shōgun, really controlled Japan. The Emperor was just a figurehead in Kyōto. 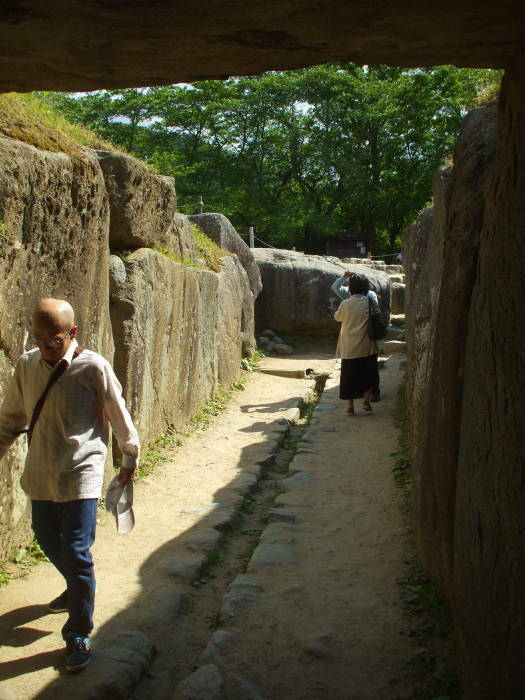 The Emperor practiced Shintō, which deified the Emperor, and the Shōgun practiced Buddhism. 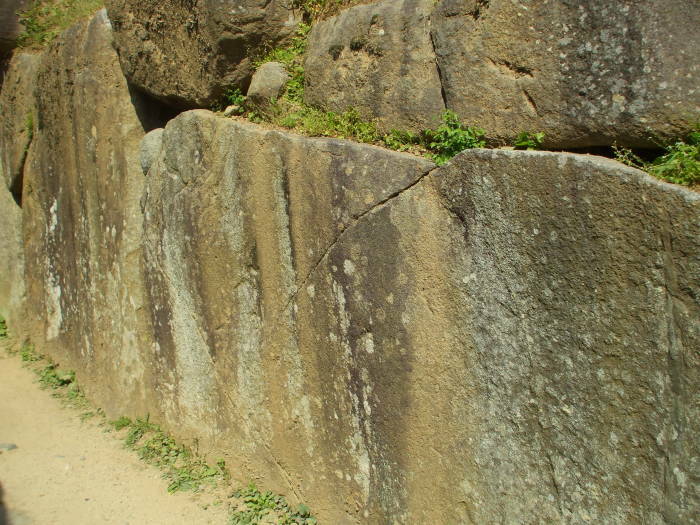 Soga no Umako was a hero of Buddhism, but he wasn't a god. 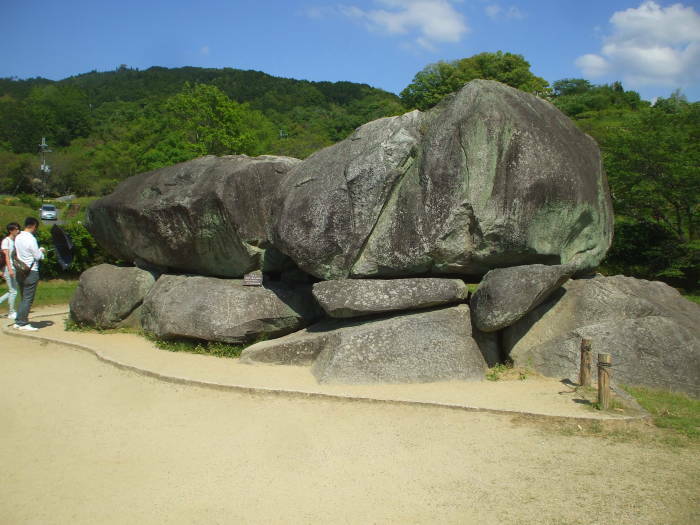 When the cult of the Emperor was re-established after the Meiji Restoration in 1858, the kofun of a Buddhist figure still wasn't absolutely off-limits. 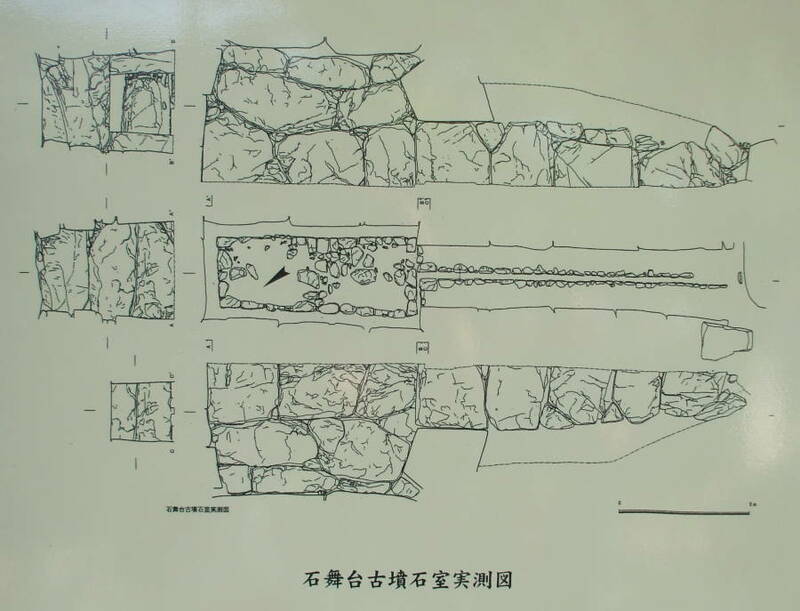 The archaeologist Kōsaku Hamada first excavated the kofun in 1933, with work on the structure and its base and surrounding moat continuing through the mid to late 1930s. 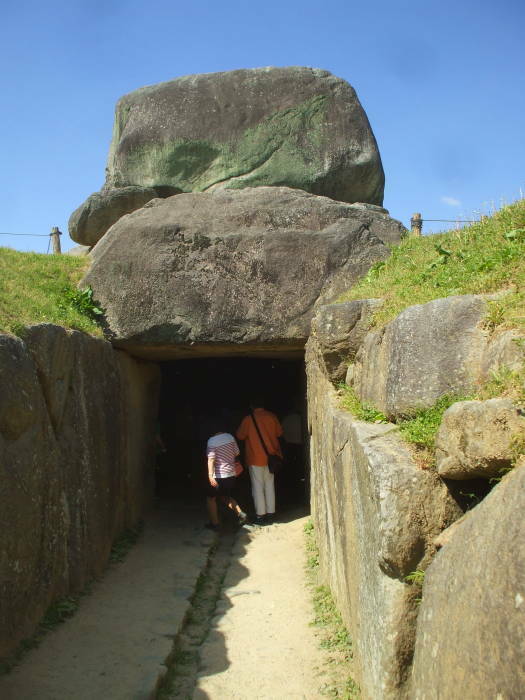 Study restarted after World War II, and excavations continued until 1975. 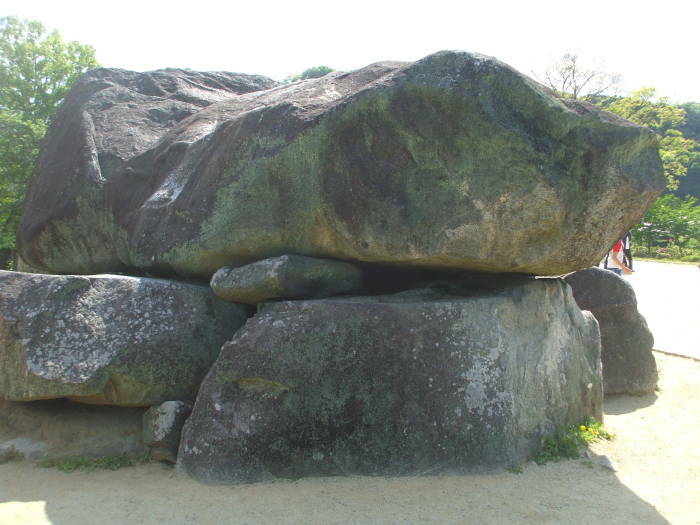 The kofun consists of an entry platform, a gallery passage, and a large rectangular burial chamber. 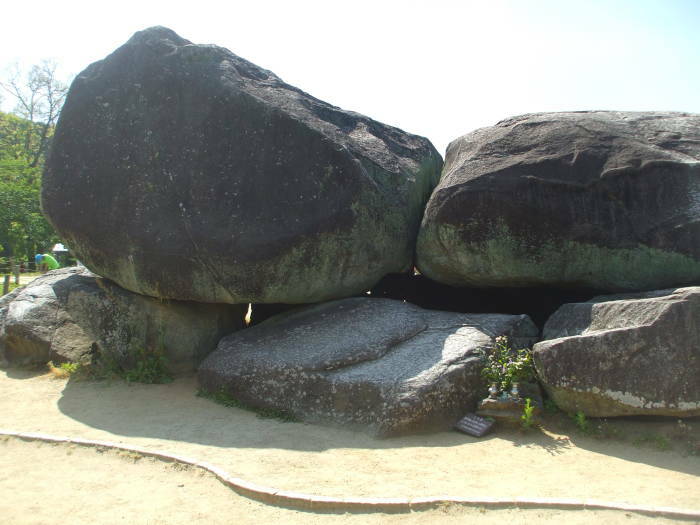 The 30 granite megaliths of the main chamber came from Mount Tōnomine, about 3 kilometers away. 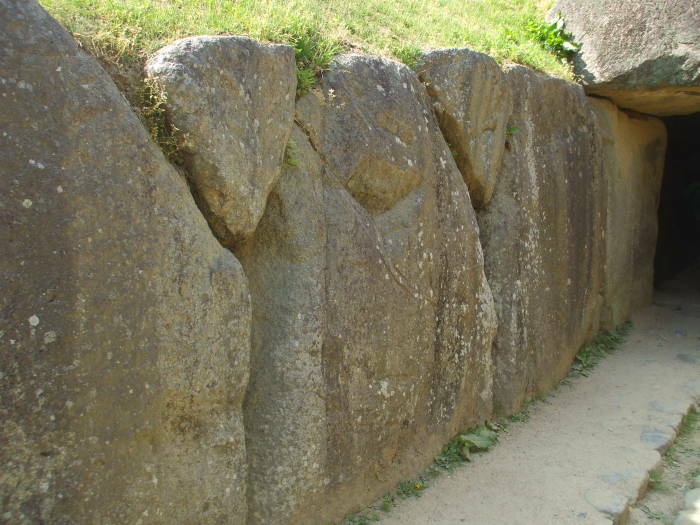 A drawing at the site shows top, side, and end views of the megalithic structure. 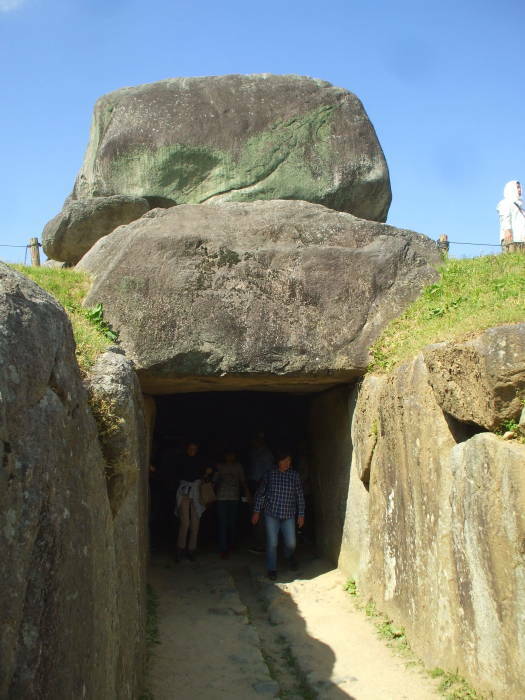 Let's walk around the main burial chamber. 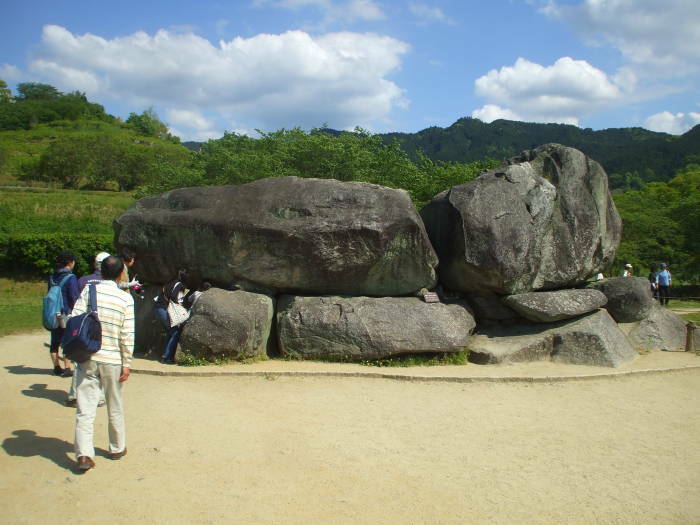 The kofun was built on a square platform 50 meters on each side. 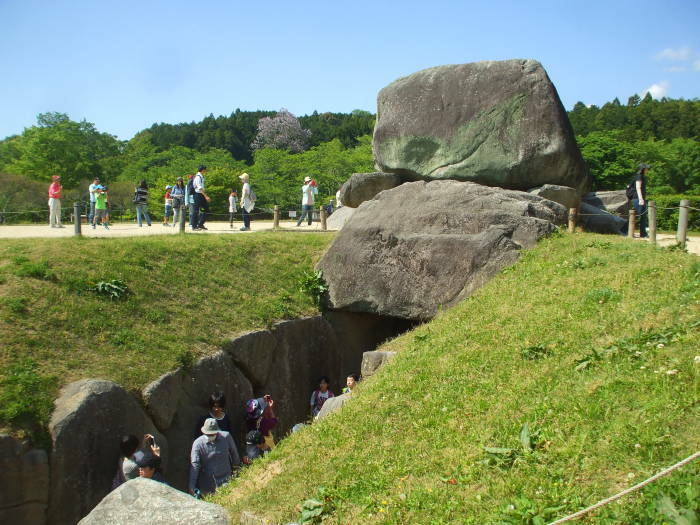 The platform was surrounded by a moat about 12 meters wide. This one was square, not keyhole-shaped. 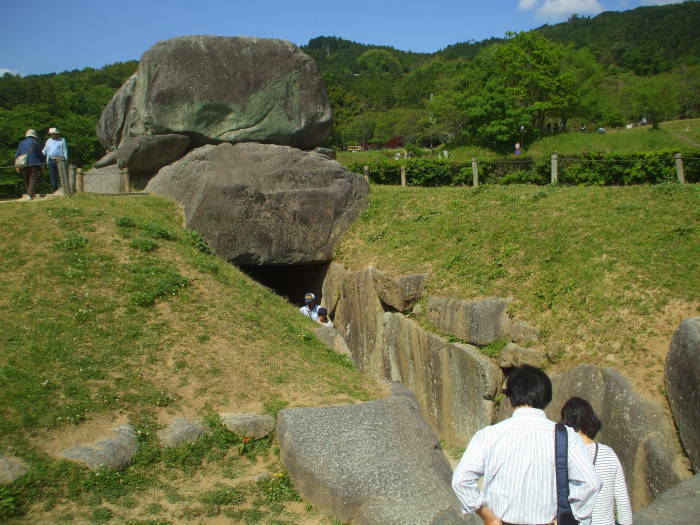 A typical kofun had a stone approach path leading to the entry gallery or passage. 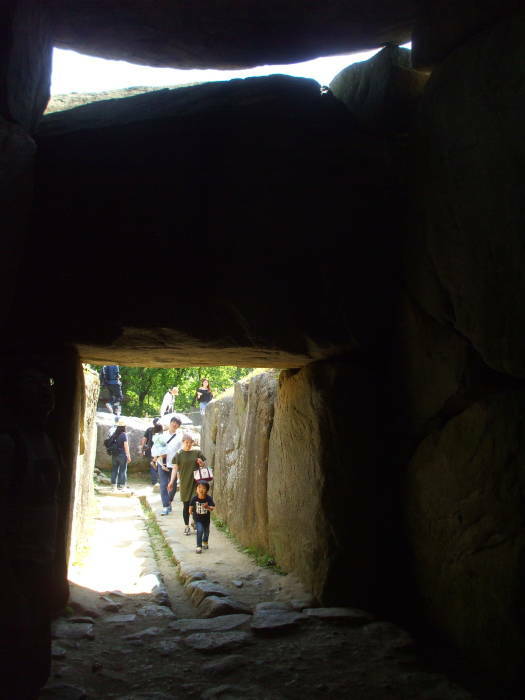 The entry passage originally had a stone ceiling, but those megaliths were removed long ago. 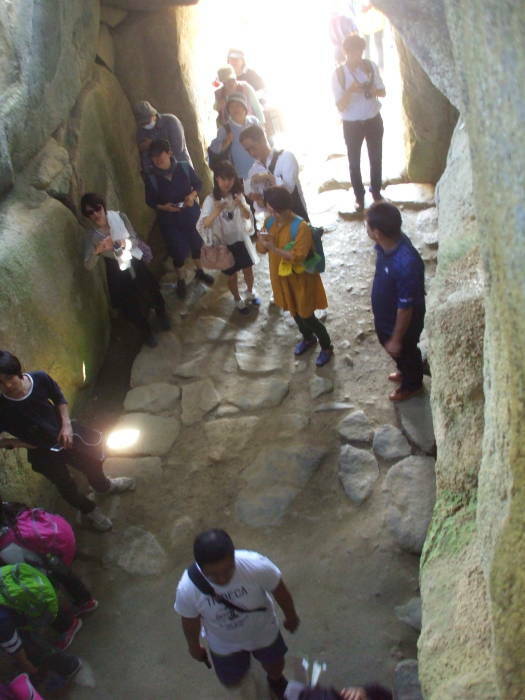 The entry passage leads north to the main tomb chamber. 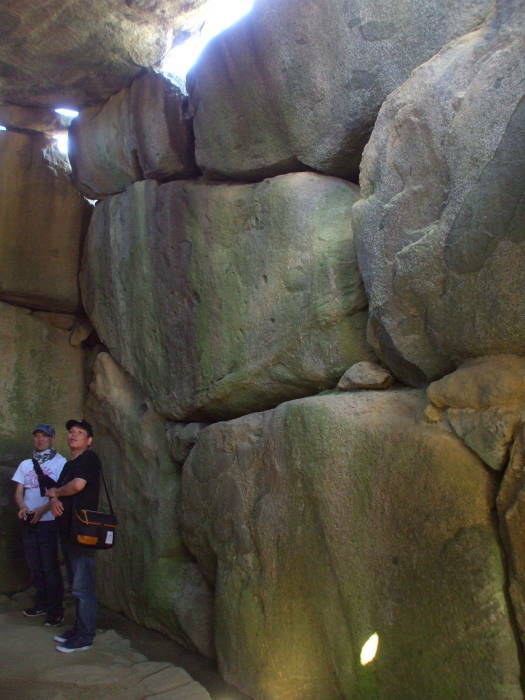 The inner chamber is 7.5 meters long, 3.4 meters wide, and 4.8 meters high. 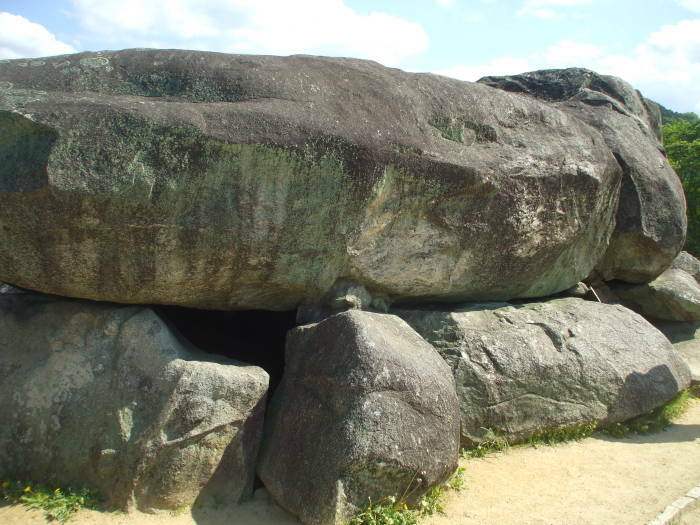 It is built from 30 megaliths. 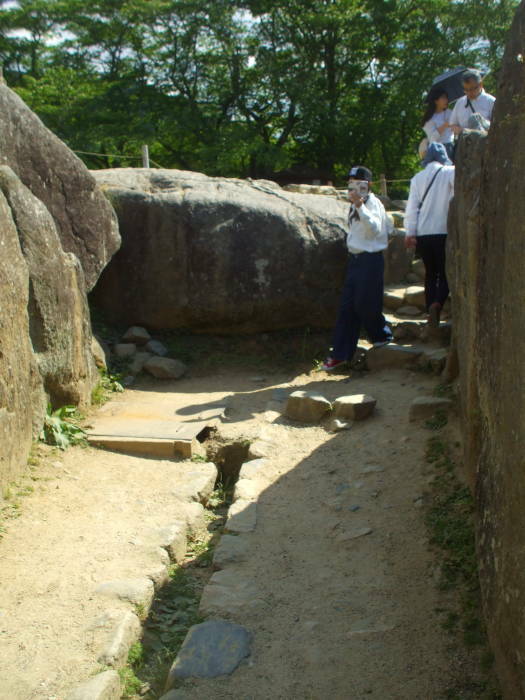 Small drainage channels run around the two sides and the far end, collecting water and draining it out through the entry passage. 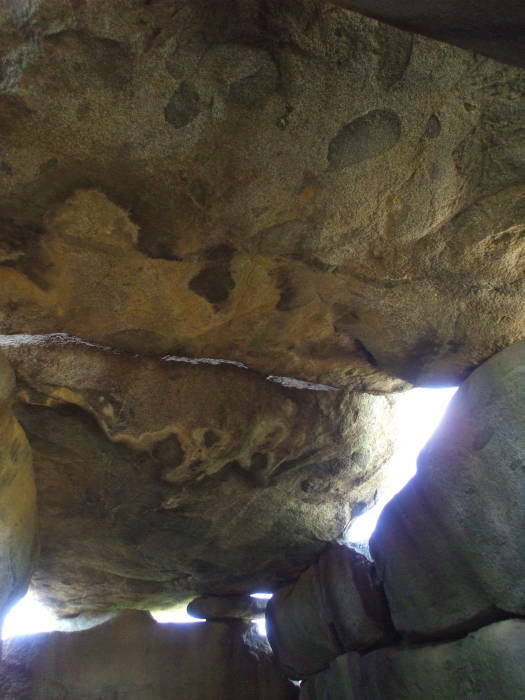 The ceiling of the main chamber is made from two megaliths weighing approximately 60 tonnes and 77 tonnes. The scientific excavations didn't find much. 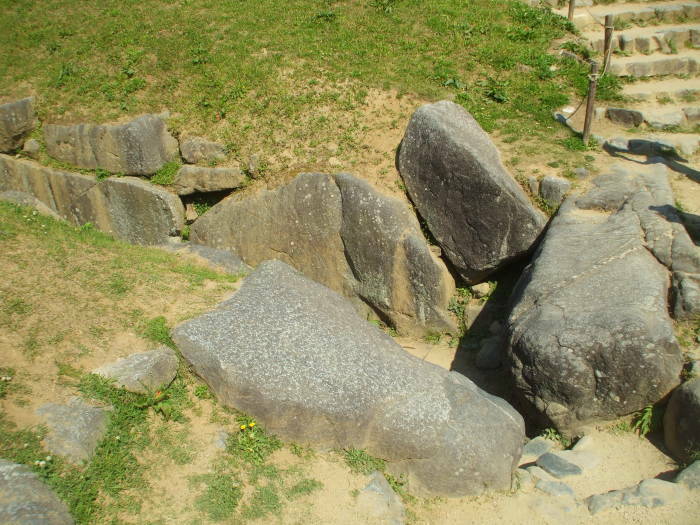 Grave goods were probably taken by grave robbers soon after its construction, especially if the theory is correct that the earthen tumulus was removed at the Emperor's command. 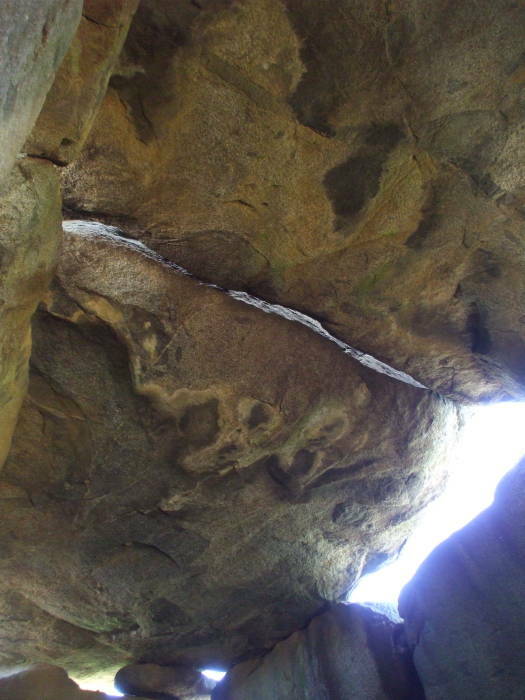 They did find remains of a broken tufa sarcophagus, and some gilded and bronze implements. 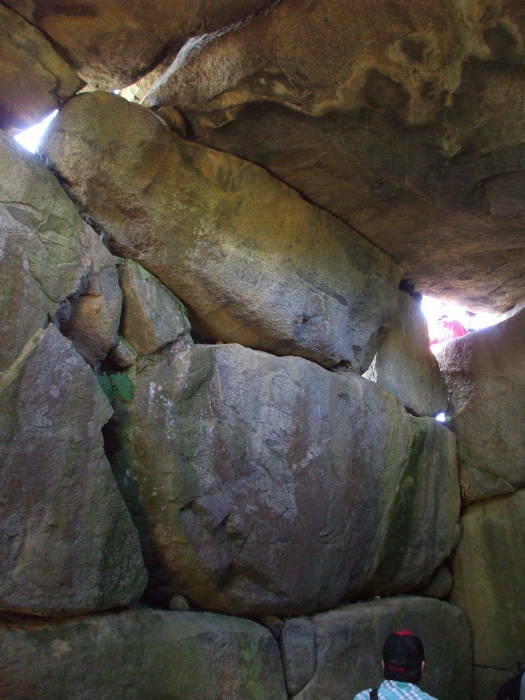 They also found signs that similar megalithic tombs had been built to its north and south.